March is almost upon us and as you monitor social sites you can feel the buzz that is “Spring break for geeks” start to build. I went to my first SXSW in 2009 and really soaked it in and chronicled the pilgrimage. I had a great time and it lived up to all the expectations I had read about it. Last year a backlash was born surrounding the conference and I posted my thoughts defending it. While I still maintain my feelings from last year, I feel that logistics are now a major concern with SXSW that will be a tough one to overcome. 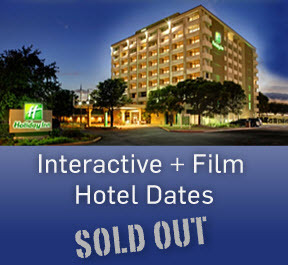 The block of hotels reserved for this year were sold out months ahead. I had to book in January and let me tell you it was slim pickens. Beyond hotel accommodations, my experience last year was that panels have spread out considerably since my first attendance. They now cover fairly long distances that aren’t short walks (or quick shuttle rides due to congestion) and can be challenging to navigate in between panels. Also, if you do make it to your panel there’s a chance that it may have already reached capacity and you’ll have to wait outside with hopes of people vacating so you can enter. There’s no doubt that these issues will be even greater this year. In any case keep this in mind as you plan your schedule for the conference. If there’s a panel you really want to see, make sure that you’re there 20 minutes before it starts. Don’t go in Blind. Have Your Comprehensive Schedule Ready! Speaking of planning, this year I’ve setup and tested 3 different web services to do just that. There’s the official SXSW site that offers you the ability to create your own schedule and also has an accompanying mobile app for iOS or Android. I’ve also setup Sched.org which I’ve happily used in previous years. A newcomer I’m trying out this year is Lanyrd. Both Sched.org and Lanyrd have a nice social component where you can connect it to your Twitter account and it will then show you the panels your friends are attending within the service. This can serve two purposes. Both giving you the ability to identify some panels you may not have considered which they’ve shown interest in, as well as a chance to find a location where you can stalk connect with them. So using both services is a good way to let your friends know where you’ll be. Another good reason to use all 3 is that I’ve seen panels, parties, and events that are unique to each of them appearing. So between the 3 you should have the best overall picture. Oh, and I forgot to mention I’m also using Plancast just in case. When using the above scheduling services I highly recommend that you select at least 2 if not 3 panels per each session during the conference. The first year some of the panels were hit or miss. In later years I got smarter by planning ahead and giving a panel 5-10 minutes to determine if it was worth remaining or whether I should find another one. By having 2 or 3 selections you have backups in case of a bad panel, congestion, or logistics issues. By having these selections readily available on your mobile device you’ll be ready to act quickly in the event of a bail. Speaking of mobile for a second, make sure you’re more than ready to supply juice to your device to make it through rigorous usage. I bought a Mophie Juice Pack last year for my iPhone which more than provided enough power for me to make it through every day. You don’t want to lose your bloodline to navigate the conference so make sure you’re prepared. There are several areas within the convention center that have on-going activities which make for a great place to network with like-minded folks. I highly recommend the Blogger Lounge which I’ve been attending since my first SXSW. This is a great place to pop in and out of in between sessions or during breaks while at the convention center. You are bound to meet some great folks there. If your work or interests are in the non-profit / philanthropy space then you should head over to the Beacon which similarly will have a dedicated space for the duration of the conference with a schedule of events and ability to network with lots of good folks. Most of the mystique that revolves around SXSW is based on the surrounding events and parties that occur outside of the convention and panel schedule. Once again your best bet to find these are using the services I’ve already mentioned. But how do you know which one of them are worth going to? Well prior to the conference you’ll see people and friends that have shown interest on those services. But the real proof in the pudding is in people’s actions. Here is where having the right tools to monitor real-time streams becomes invaluable. It’s easy to get caught up in the hype of larger than life parties but I have found that many of the big ones aren’t worth attending. There’s long lines, once you get in they are super crowded, and my biggest pet peeve is that the music is blaring and you can’t hold a conversation with anyone. I do make some exceptions here but my goal is always to connect and communicate with great people. My strategy on parties is similar to panels. There’s tons of them going on concurrently so if you’re not getting anything by connecting with people at the one you’re at within 10 minutes it’s time to plant your head back into your phone to find where to head to next. There are several things I recommend doing. Make sure prior to heading out that you have befriended people who will be attending on Foursquare. One year I realized that I had many friends on Twitter that I hadn’t connected with on Foursquare. That was a mistake. It has become the defacto standard for location at this point and will help you determine where the people you want to hang out with will be. Speaking of Twitter you should also create a list of attendees you want to connect with and have that list at the ready on your mobile device. Every year there seems to be an app category that gets hype leading up to the conference. Strangely enough and in a meta sort of way, it’s one that you can utilize at the conference. Twitter and Foursquare were born at SXSW and last year it was group messaging / texting that were hot. I successfully used these last year to get a hotel room which I was without upon the plane landing in Austin last year. This year’s app category that I”ve gleaned having the most hype around are what I would call passive or ambient location apps. These apps will track your location and then passively push alerts to your mobile device based on your proximity with other people near you. The trigger for the alerts are based on factors that could include one degree of separation friendships (A person that’s a friend of a friend on Facebook) or common interests (Also based on Facebook likes). So the point here is that instead of explicitly checking in or monitoring your friends checkins you can be somewhere and have a very serendipitous encounter with an existing friend or someone new you may want to meet. Before you go all crazy with privacy or stalking concerns you both have to be using the app and opt-in for this magical human collision to transpire. Robert Scoble who’s always on the pulse of top apps at SXSW wrote a good post on the two top contenders in this space called Highlight and Glancee. I’m trying both of those as I’m curious to see the results. 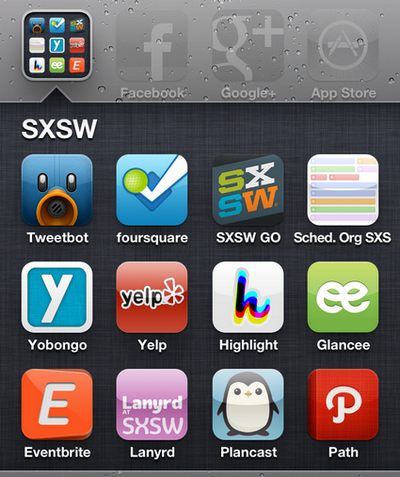 You can find other recommended apps Scoble recommends to use at SXSW over on Google+ here. I can go on and on and this post has already gone on for too long and an area I didn’t cover much of (besides being prepared to torture your mobile device) is other “survival guide” tactics. There are plenty of them out there if you just Google them but I came across this pretty cool one this year which even has an innovative design based on this year’s social darling Pinterest. Well there you have it, my ramblings trying to provide some experience to help you out. I hope that SXSW is as magical for me this year as it has been in the past. I’m worried about logistics and am curious how we shall all fare regarding that once we’re there.